What is the Certificate of Recognition Program? The Certificate of Recognition program is an incentive program recognizing and rewarding employers for implementing an effective Occupational Health and Safety (OHS) program which demonstrates a commitment to workplace health and safety. Participation in the program is voluntary. The COR program is a natural extension of your existing health and safety program. Our Consultants and Advisors will help you fill the gaps in your safety program and decide if now is the right time to take part in the COR program. The program rewards employers who are committed to reducing workplace injuries and encourage worker participation. COR certification is offered by WorkSafeBC and delivered through Certifying Partners. 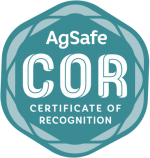 AgSafe is the COR Certifying Partner for employers in the Agricultural industry. The payment is dependent on successfully completing an Occupational Health and Safety management program audit. Companies in the agricultural sector, Classification Unit’s 701001 to 701029, are automatically eligible to participate in AgSafe’s COR program. Companies outside of the agricultural industry or naturally aligned that are interested in pursuing COR may submit a COR application to AgSafe for review. A company’s commitment to a healthy and safe workplace include; Increased employee loyalty, moral and decreased injuries. This translates into gains in productivity, quality and profitability. A win-win for everyone! 75% of their premium up to a $1000 as an annual incentive payment from WorkSafeBC. Or 10% of their premium if their incentive is over $1000 as an annual incentive payment from WorkSafeBC. Over time, with reduced injuries and lower claim costs, a COR company’s experience-rated WorkSafeBC premiums will reflect additional savings. Is a competitive advantage when competing for jobs in many agricultural industries. Small employer classification is allocated to a company with 19 or less full-time employees. Small employers participating in COR must train an internal auditor from within the company to complete the annual maintenance audit requirements. Employers, with 20 or more full-time employees, require an external auditor to complete the certification audit. An internal auditor will be required to complete the annual maintenance audit. If you want to learn more about the benefits of COR, or have any questions about the certification process, give us a call now! Our friendly Consultants and Advisors will be happy to help. COR prevents people from getting hurt ….. It is the right thing to do! I believe it will save lives. The COR program is easy to use, there is an incentive at the end …. It is a Win Win situation! Becoming COR certified validated everyone's hard work and gave us a sense of recognition. COR has saved us a lot of money and productivity is up …. there is not as many people getting hurt. The COR incentive payment is nice … but increased employee engagement and morale was the real bonus!